Museum stepped in to prevent it being sold abroad. 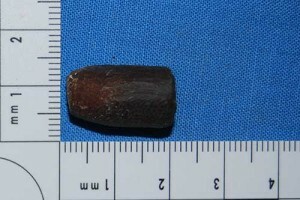 Lawrence’s first dagger, given to him by Sherif Abdullah, was in turn presented as a gift to the Howeitat chiefs, and has presumably disappeared forever. 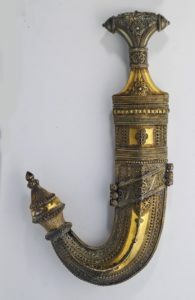 A gold dagger made specially for him in Mecca was sold to Lionel Curtis for £125 to fund repairs to his cottage, Clouds Hill, and is now in the collection of All Souls College, Oxford. dagger and robes were sold to overseas buyers for £122,500 and £12,500 respectively. The Government then put an export bar on both items, to give an opportunity for buyers to match the price and keep them in the UK. 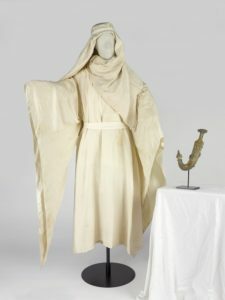 A further £35,000 grant from the National Heritage Memorial Fund has enabled the National Army Museum to buy an ivory silk robe and silk headdress belonging to Lawrence which were auctioned in Christie’s Out of the Ordinary Sale in London in September. The robe was one of two given by Lawrence to the mother of his Tank Corps friend Arthur Russell, with instructions to cut them up to make dresses. Luckily, this one was saved from the scissors. It was bought for £27,500 in the sale. The silk headdress, given to the artist Cosmo Clark when he depicted Lawrence in 1922, was bought for £8,125. woven from red silk and gold thread, given by Lawrence to Janet Laurie, which sold for £10,000. A purple silk and copper agal which Lawrence presented to Clare Sydney-Smith, wife of his commanding officer at RAF Cattewater in Plymouth, fetched £27,500. Announcing the purchase of the dagger, robes and headdress for the nation, the National Army Museum drew attention to the immense cultural impact that Lawrence has had in the century since his wartime achievements. The dagger and robes will go on show at the museum, in Royal Hospital Road, Chelsea, when it reopens after a major refurbishment next year. To see the full press release, click HERE. 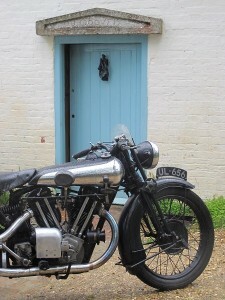 21 May 2016: UL 656 – Lawrence’s penultimate Brough Superior motorcycle, known affectionately as George VI – made its first public appearance for around 50 years, when it returned to Clouds Hill cottage as part of the National Trust’s annual Lawrence Week. 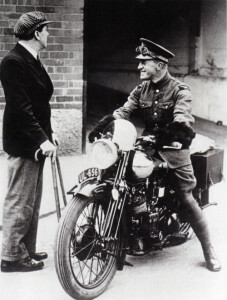 Lawrence bought the motorcycle after returning to the UK from his RAF posting in India in 1929, and owned it until 1932. It appeared at Lawrence Week as part of a rally of Brough Superior motorcycles organised by Alan Payne, of the T. E. Lawrence Society and Brough Superior Club, and Bob Burden, of the Brough Superior Club. For more news on the Lawrence Week events, see HERE. For more about the meeting, see the Dorset Echo’s coverage HERE. 3 May 2016: A temporary export bar placed on Lawrence’s silver-gilt dagger and robes, after they were bought at auction by a foreign buyer, has been extended to 1 July. The Arts Council, which administers temporary export bans on items of cultural significance, said serious expressions of interest have been received. A new buyer will have to match the auction price of £122,500 for the dagger and £12,500 for the robes. For more, see the coverage in The Independent HERE. 29 April 2016: After the Society submitted an objection last year to Dorset County Council’s draft proposals for a sand and gravel quarry half a mile from Moreton village, we have now been invited to present our views to the Bournemouth, Dorset and Poole Minerals and Waste Policy Joint Advisory Committee in May. Society vice-chair Alan Payne – a planning consultant who wrote the Society’s response to the quarry consultation – will be attending to speak on behalf of the Society and to present an online petition, “Let Lawrence of Arabia Rest in Peace”, which was signed by nearly 450 people from around the world. The Society believes that the quarry proposal will have a disastrous impact on the tranquil surroundings of the village of Moreton and the cemetery where Lawrence lies. We will keep members updated on how the consultation progresses. Dorset County Council’s proposals can be viewed at http://consult.dorsetforyou.com/portal/draft_minerals_plan…. Go to Appendix A: Site Allocations, then scroll to Site AS-25. Two submissions by the Society can be found on page 5 of the responses to the consultation. 31 March 2016: A bullet discovered in the Arabian desert by a team of archaeologists working as part of the Great Arab Revolt Project has appeared to confirm that Lawrence’s account of the revolt in Seven Pillars of Wisdom is largely accurate. GARP excavated dozens of sites across the Arabian desert associated with the 1916-1918 Arab Revolt. Dr Neil Faulkner’s book Lawrence of Arabia’s War was published by Yale University Press on April 21. 28 February 2016: Theeb – Naji Abu Nowar’s film set during the early days of the Arab Revolt – has become the first Jordanian film ever to be nominated for an Oscar. Though it lost out on the night to Hungarian film Son of Saul in the Best Foreign Language Film category, the Oscar nomination capped a hugely successful year for the film, including a Bafta for writer/director Naji Abu Nowar and producer Rupert Lloyd in the Outstanding Debut category, and the Orizzonti Award for Best Director for Naji Abu Nowar at the Venice Film Festival. The film, telling the story of a Bedouin boy’s coming-of-age, when he embarks on a treacherous journey with a mysterious British Army officer, was shot entirely in Jordan using local Bedouin tribespeople. 2 February 2016: The Department for Culture Media and Sport has placed an embargo on the export of Lawrence’s silver-gilt dagger and robes which were auctioned at Christie’s in London last year. Two of T.E. Lawrence’s most iconic possessions are at risk of being exported from the UK unless a buyer can be found to match the asking prices of £122,500 for his dagger and £12,500 for his robes. 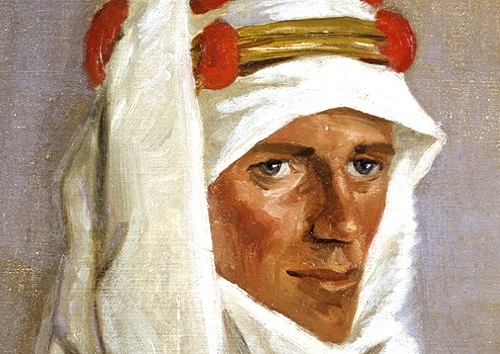 Lawrence was considered one of the most recognisable figures of the First World War, following his work in the Middle East and his involvement in the Arab Revolt. Oscar-winning film Lawrence of Arabia. Lawrence posed with both the curved dagger – called a jambiya – and the robes while sitting for the sculptor Lady Kathleen Scott, the widow of Scott of the Antarctic, in 1921. He left them behind after his final session so Scott could continue working and they have remained in her family ever since. The decision to defer the export licences follows a recommendation by the Reviewing Committee on the Export of Works of Art and Objects of Cultural Interest (RCEWA), administered by Arts Council England. deferred until 1 April 2016. This may be extended until 1 July 2016 if a serious intention to raise funds to purchase the robes is made at the recommended price of £12,500 (plus VAT of £500). deferred until 1 April 2016. This may be extended until 1 July 2016 if a serious intention to raise funds to purchase the robes is made at the recommended price of £122,500 (plus VAT of £4,500). 1 January 2016: The T. E. Lawrence Society has submitted a formal application to Historic England to list Lawrence’s childhood home at 2 Polstead Road, Oxford, as a Building of Special Architectural or Historic Interest. Working with Councillor Liz Wade of Oxford City Council, the Society was fortunate to be able to draw on support from around the world to put together documentary evidence to back its application, including photographs by members who have visited the house, and an architectural assessment by Robert Franklin of All Souls College. together with the bungalow built in the back garden for the youthful T. E. Lawrence, the Society’s application points out that 2 Polstead Road must be considered essentially to be a “building at risk”, having been empty for some time since the death of the previous occupant. The Society will keep members informed on how the application progresses.